Ok.. This is very simple to make, what you need to have is a blender for the following recipe. But, not sure why, my fruit juice is not as strong and sweet taste as the one I have tasted from the store. Are some kinds of fruit essence or sweetener added into the juice? Or is it simply due to the sweetness of the fruits used? I am not quite sure though. So, I am going to remind you that my special fruit juice might not be as sweet and flavorful as other fruit juices. This combination of fruits juice tastes simply subtle and you will really like it only if you prefer plainer type of smoothie-like fruit juice. Otherwise, use honeydew-flavoured milk to make the juice tastier, if you want to. Anyway, this romantic pink smoothie should be one of the top choices for you and your loved ones on the Valentine’s Day or any other occasions. Peel and cut all the fruits into chunks. Place fruits, ice cubes and milk into the blender. Blend all ingredients into smoothie on medium/ high speed. Add honey and blend it on low speed for a more few second, if preferred. Serve immediately. 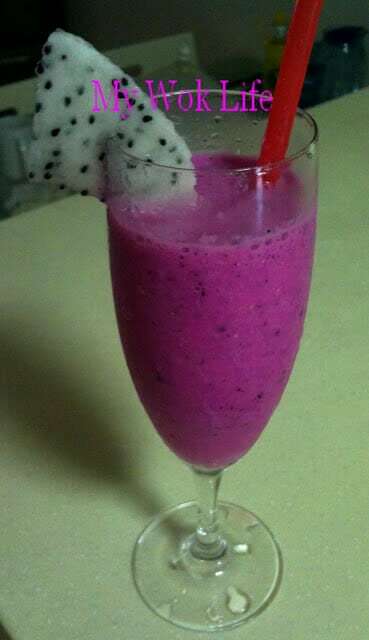 A glass of my special dragon fruits juice (with honey added) counts about 90kcal. Minus off 20kcal for the juice without honey. Tips: Honeydew has to be really sweet to get better flavour in the drink. * You may also replace plain low-fat milk with honeydew flavoured milk instead. * Reduce the amount to half for serving of just two glasses. Looking very fantastic idea for Valentine’s Day, I am including this recipe in my Valentine’s Day list. Second fruit basket with chocolate covered strawberries is also a magical inspiring gift for Valentine’s Day.